I won't hold my breath this time - not that I did any of the previous times either (here). But apparently, here are some new rumors about a wedding in March. The Internet (or "tubes," as the felonious Senator Ted Stevens of Alaska likes to call them) is buzzing again with rumors of a Tom Brady-Gisele Bundchen wedding. Word is the supermodel and Pats QB are planning a small, mid-March wedding in Costa Rica, where the two have previously frolicked at Bundchen's vacation home. We're dubious but watching for that save-the-date card. 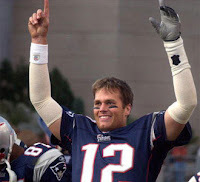 What I'd like to see/hear are some rumors about when Tom Brady is going to be playing football again. Has anyone seen heard anything on that topic? 0 Response to "Even More Tom Brady & Gisele Wedding Rumors"